For over a decade, the guideline for gift giving in my family has been CONSUMABLES. So if you can't eat it, drink it, or use it up with in a year, it's likely not getting underneath the tree. I will say that good wool socks do fall into this category because there is officially a sock monster that eats and hides socks. So each year, instead of leaving with armloads of things (that I may or not need) to fill my house, I leave with edibles and delectables. It's like in Little House On the Prairie when the fresh orange in the stocking is such a rare treat that it gets eaten with the reverence of a gem. And yes I truly did get oranges in my stocking growing up. Of course, more lasting objects are appreciated when needed or when they connect us to the heart of our intention. Like the new book that keeps me company for those winter quiet days before work and school start back up. Or the special yoga prop that facilitates our deepening practice. I’ve been getting inspired to declutter….my office, my closet, my thoughts with Soulful Simplicity by Courtney Carver. So much inspiration tucked inside this little book. In the spirit of simplicity, and our attunement to the environment, our health, and the quest for more connection, not more things, I invite you to consider the Consumable Guideline. See how this boundary creates more freedom in joy in your lived experience! You can just start small by making a deal with one loved one…or propose it to your entire family and see where it goes! Over the past 15 years of working in agriculture, I’ve gotten a lot of dirt underneath my nails and haven’t been what many people would say “very girly”. But in the process of becoming a yoga teacher, I’ve become more aware of the importance of self-care. Most of my practices are about creating beauty from the inside out. But I’ve also come to realize the importance of skin care and the power a little lipstick has to make me feel good! Self-care practices are the daily rituals that bring us back to our true Nature. When I first heard about Beautycounter I was totally uninterested. But I’ve come to learn; sometimes the things we avoid are exactly the areas where we have an opportunity for growth. Like everyone else in my generation, I grew up on trusted products such as Dove, Pantene, and Johnson & Johnson. When I was a teenager a Noxema facial was a special treat. I thought I was taking care of myself. I trusted the products because my parents had bought them for me. When I went away to college my best friend educated me. She told me that chemicals were hiding out in the personal care products I was using. So I started shopping at health food stores for my shampoo and made DIY herbal spa products. I took care of myself. I would try and educate my family and everyone I knew. It’s become a joke about me and my soapbox! Seeing another generation of grow up with unsafe products is extremely upsetting for me to witness. And then recently I went to a “conventional” grocery store. I was shocked by the products made available to people. Nothing has changed. In fact there hasn’t been a major federal law regulating personal care products since 1938. How come this is still ok for children to be exposed to these chemicals!? What if no one had ever told me that they were bad for my health!? I owe a lot to my best friend in college. She taught me a lot. And now I want to help educate other people. So when I heard about Beautycounter’s mission to educate consumers and advocate for laws for safer self -care products so that EVERYONE can have access to safe products I got on board. This is really about a movement to create change in the US’s beauty industry! AND about having a little fun! Schedule a free 15-minute consultation– In Trumansburg, at my Yoga office in Ithaca, or I can send you some products through the mail. Host a Self-Care Social –Gather friends, family or co-workers for a fun (and FREE!) night of self-care. Perfect for Open Houses, Baby Showers, Bridal Showers, the Holiday Season or just any old Friday night! Hosts are eligible for free gifts just for hosting! There are also opportunities to become a member or a consultant! Take your beauty and wellness into your own hands while joining a movement to create lasting change in our world. My admiration for the colors of this season grows every day. We have been taking long hikes in the National Forest and I feel like our time spent outdoors is like color therapy. The colors are so synergistic and pleasing to my eye. And as I walk over the fallen leaves of a tree, it’s like walking over a field of color and I’m reminded of my love of Mark Rothko paintings. What artist do you love that seems to captures the magic of color? I am so thankful for the work of Robin Wall Kimmerer for helping me to more fully understand and appreciate the beauty unfolding around me. In nature we find examples of aligned collaboration that are both beautiful and fruitful. These metaphors can provide inspiration for our yoga practice as we begin to more deeply understand our lived experience of the present moment. In Ayurveda (the sister science of Yoga) everything that we come into contact with has to be “digested”. Every sound, all media, each conversation…everything has to get processes. The fields are embroidered with drifts of golden yellow and pools of deepest purple...As it turns out goldenrod and asters appear very similarly to bee eyes and human eyes. We both think they are beautiful...Their striking contrast when they grow together makes them the most attractive target in the whole meadow, a beacon for bees. Growing together, both receive more pollinator visits than they would if they were growing alone. It is a beautiful phenomenon simultaneously material and spiritual...take a few minutes to pause and be with the color. You can practice outside in nature or inside using your imagination. Choose a comfortable spot where you can be undisturbed for a few minutes. Notice a pleasing color around you or bring into your minds eye one of your favorite colors - a particular flower, a gorgeous sunset, etc. Pretend to drink in the color. Draw it inward. Assimilate it. Let it fill your body. Like you were painting the inside of your body with this beautiful color. Notice how you feel. Does the color seem to want to stay in a certain part of you body? Maybe above your brow or in the center of you heart? Or does it move around or want to shift color? Try a different color now or at a later time and observe if it feels similar or different. I recently have been doing more computer work than usual and my body is telling me that I need to break up my work with stretches. Do you sit long hours at a computer? Is pain or discomfort in your body telling you that there is something out of alignment? This orientation to the front body isn’t bad…it just needs to be broken up with complimentary actions that create more balance in your body and connect you to the universality of your back body. The alignment principles of Anusara Yoga can help relieve tension in the neck, shoulders and hips. 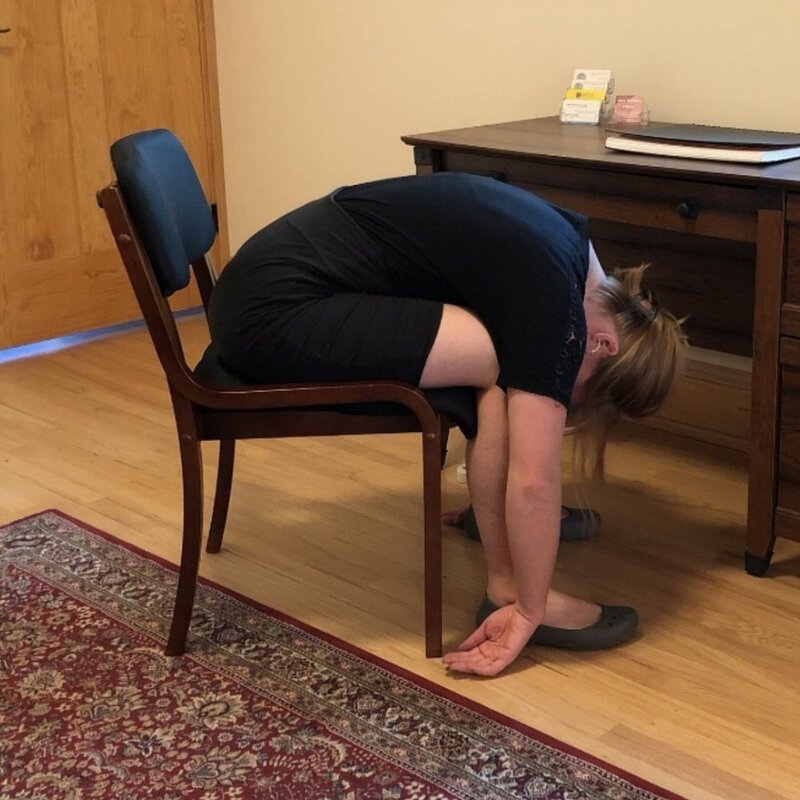 Here are a few of my favorite chair stretches that can be incorporated into your day. Just spend a few breathes in each pose and this 3 minute break will leave you feeling refreshed and more at ease in your body. SHOULDER OPENER WITH OPTIONAL LUNGE – The perfect antidote to neck and shoulder tension! Bring the back of your right hand to your sacrum (the bony area at the back of your pelvis). Press your hand into your sacrum and mover your right shoulder back. Now straighten your left hand above your head. Palm faces inward and draw the upper arm back towards your ear. Keep on drawing both shoulders together on your back body as you raise your face, heart, and upper lungs towards the sky. Release both arms to pause and feel. Do the other side. This can also be practiced with a lunge. Sit on the edge of your chair facing to the side. Sit on the left buttock and bend that knee. Stretch the right leg behind you and hug both legs together strongly and follow the above directions for the arms. You might be surprised how challenging this chair pose can be! Hold for a few breaths and then do the other side. BACK BODY OPENER – AKA a forward fold. Sit at the edge of your chair and take your feel wide. Press them firmly into the ground as you drape your upper body on your thighs. Let your arms dangle towards the floor. Let your breath find the sensation in your legs, hips, or back. SEATED TWIST – This pose is helpful for relieving lower back tension and balancing your nervous system. Sit at the edge of your chair and firmly connect your feet to the ground. Keeping your hips stable and facing forward as you twist your upper body to one side. Press your hands into your chair to get taller and glide your shoulders back. Breathe. FRONT BODY OPENER – AKA a back bend. Lay your body over the back of your chair. Spread your legs out and let your arms drape down. Breathe into the expansiveness of your front body. This can also double as a mini-savasana. Thanks for reading! I hope these are helpful. Be in touch if you have any questions about the poses! Pictures were taken at the Well-Being Healing Center. Image Description : A woman is laying on her back in a restorative yoga pose in the middle of a field. Her legs and head are supported by yoga blankets. Recently I’ve had several clients share with me how tired they are. Here in the Northeast we are enjoying our narrow window of warm weather and we all want to take advantage of every last minute of it. This often means long days that melt into nights, extra social activities, yard work, blueberry picking, and all that on top of our usual work and family responsibilities. It’s no wonder we are exhausted! The Japanese have a word for summer fatigue - NATSUBATE which describes the lethargy that may result from too much sun exposer, not enough sleep, and the bodies difficulty in adjust to the fluctuations in temperature as we go in and out of air conditioning. Summer fatigue is a real thing. How can we let the fatigue of July give way to the beautiful light of August?! With the impending back to school and fall weather, I am often called this of year to reconnect to presence. Try this exercise which I call the YOGA PAUSE BUTTON. 1.) Stand outside. Feel your feet on the ground and the air on your skin. 2.) Listen to the sounds around you. What do you hear? In front of you and behind you. Listen to the 3 dimensional sound landscape. 3.) Identify the furthest sound away from you that you can hear and then the closest. 4.) Take 3 deep breaths. Listening to the sounds of nature is very healing. On a daily basis we process vast amounts of sensory input, which can lead to SENSORY OVERLOAD. Tuning into one sense at time, in this case our hearing, gives our nervous system a chance to “catch up”. In combination with our breath we send a signal to our nervous system that we can rest in this moment. Push your YOGA PAUSE BUTTON whenever you feel tired or overwhelmed to bring your body towards a more healing parasympathetic state. Image Description: A cupped hand is filled with white and purple violets. Last summer I struggled with a case of Lyme disease that went undiagnosed for over 5 months. Although I’m back to normal, like many people who get very sick, I was forced to reflect deeply on what I wanted to do with my very limited energy. Some mornings my practice consisted of me lying on blankets and breathing. At times I barely had enough strength to move my props. I simply could not do all that I was used to doing, so I looked with-in for answers. It was at that time that I chose to focus my teachings on Restorative Therapeutic Yoga. Every since I was a little girl I’ve always wanted to be helpful and contribute to creating a world that was just and beautiful and that “felt right”. Nineteen years ago, when I stepped into my first yoga class, I did not know how my path would unfold.But through a deepening of my practice, I began to connect more and more with my own heart’s path. In my desire to help those who would benefit from individual attention, I opened my own private practice. I deepened my study of restorative yoga and delved into the studying the chakra system and energy work. And still this quest to serve populations outside of the yoga studio has grown. Recently I began working with people undergoing treatment for cancer and took a training in Trauma Informed Yoga. If you’re reading this, like me you probably believe in yoga’s powerful ability to help people heal. I know that my yoga practice was crucial in my own recovery from Lyme. And the science is backing us up more and more every day! Have you seen any flocks of snow geese this year!? When these feathers washed ashore it felt like a moment of inter-species connection between me and these strong and elegant creatures. Always inspired by migratory birds, I too find it crucial to seek out nourishment and inspiration through travel. To deepen my restorative yoga and embodiment practice, I've recently migrated to take a few trainings. I am excited to share this work with you this spring! SPRING RESTORATIVE SERIES - Deepen your relationship to ground and breath for relaxation and healing. 4 Tuesday evenings beginning 4/10 at The Hidden Door in Tburg. More info and registration here. MORNING CLASS - This spring (beginning 4/4) I will be focusing on the organs and how they can support us in the embodiment of our asana. Gentle practice practice for building awareness and connection between the body-mind. Every Wednesday 8:05am at Lakshmi Living Arts. GENTLE ENERGY WORK - I've been training in the subtle body and am really enjoying the sweet heartfelt energy of Reiki. This gentle healing practice can be woven into any private session with me. Happy Vernal Equinox to you! Have you ever noticed that when you put your head underwater in the bathtub it's easier to hear your own heartbeat? When we practice slowing down and LISTENING, we are able to tune into deeper rhythms and the complex ways they overlap and interact. Rhythms in our body. Of the Seasons. Cycles of the moon and planets. Ups and downs. Phases of conflict and growth. Enter in the drumbeat...I've gained profound awareness through meditating to the rhythmic sound of AnneSierigk playing her Shamanic drum. I'm so thankful she's joining me for my first Restorative Yoga Mini~Retreat! Anne shares this quote. In the presence of the drum, some people see visual symbols that give them profound insight into their lives. Others get drawn into a deep state of relaxation or meditation. When I hear the drum it opens me to a deep somatic and sensory experience of my own aliveness and I sometimes receive messages about my own healing. Each person has their own unique experience and I am curious what the drum will do for you? Seed of the Heart ~ What do Spring & Restorative Yoga have in common? Have you ever noticed the difference between the action of working hard to create something and the process of allowing something to just emerge? The latter is like a beautiful doodle unfurling itself from your pen with out much thought or effort. Or a conversation that meanders smoothly like water, so that at the end both participants feel quenched and satisfied. Spring is like that….we just get to enjoy the process as it appears. We don’t have to do anything or work to make the beauty…it just happens. All we have to do is step into the flow. Where do you notice this pattern in your life? For me, Restorative Yoga beautifully expresses this process of unfolding. Instead of heating a muscle and actively stretching it, we support the body with props and work with the breath and mind so that the muscle softens on it’s own. I feel its grace in my own body and see the almost magical impact it has on my students. Earlier this spring I completed a Restorative Therapeutics Teacher Training and everything just feels so right about it. I am so happy to have begun offering PRIVATE RESTORATIVE SESSIONS with this work. The essence of allowing also manifests in relationships. Over the past three years I’ve had the pleasure of receiving Acupuncture treatments from Abby Richardson. From our easeful patient/doctor dialogue (and our nerdy passion for the vagus nerve), an interest in collaborating has emerged. We will be offering a RESTORATIVE YOGA WITH ACUPUNCTURE class on Wednesday May 24th at Rasa Spa (Needle-free treatment available). Join us for this unique opportunity to ease the transition from Spring into Summer. I'm also offering a Memorial Day Morning Restorative class at Rasa Spa - link below! And while we are on the topic of "new & good" - full disclosure - I never owned a pair of adult sneakers until a year ago! I've always been active (hiking, biking, paddling) but shied away from anything that involved exercise gear. Working with my inspiring personal trainer Kathy Lucas, has moved exercise from my “to do list” into my self-care toolkit. Check out her all levels SPRING GORGE CIRCUIT TRAINING for a fun way to increase your strength, stamina, and agility. Many thanks to these two amazing women! And many thanks to all of you - whether you are a supportive friend, someone who has attended a Farmscape Yoga workshop, or you come regularly to my weekly class. You all help me to let in and share the light! What is your vision for yourself, your family, community, for the the world? These questions seem so important now more than ever. Almost everyone I speak with is really struggling with finding steadiness in this time of unease and transition. Setting aside time to tune in to quietude and connect to community can lead to potent transformation. Denise Hatch and I are creating a space to support you in this process. Deepen your practice and find harmonious clarity in this time of unsteadiness and plant the seeds of your vision for the future! Come join us at Lakshmi Living Arts March 17-19th for our Spring Equinox Retreat. Through the practices of Asana, Meditation, Contemplation, Divine Dining, Restorative Yoga, and Self-Care, we will explore what it is to restore and stay steady in our own power and move forward with intention. Retreat includes a fabulous candlelit dinner with Iron Owl Kitchen. The retreat is open to all - including beginners so please share with anyone you know who may be interested. Reserve your seat at our table and add your voice to our conversation! What beauty is awaiting you in this New Year? Where in your body do you experience it and how can you be more open to its grace in your life? On New Year's Day, Farmer Melissa showed me how to brush and harness the draft horses at the Finger Lakes Cider House. My senses delighted in the smell of hay and the warmth of the animals. She hooked up the sleigh and took us on a tour of the orchard. The steam was rising from the horses backs' and drew our attention to the sky where we saw a Bald Eagle flying across the farm. It was just a brief sighting, but in that instant our hearts melded with the freedom of its flight. An auspicious sighting for New Year's Day! For me, the return of the Bald Eagle (once nearly extinct due to the use of DDT) is a marker of the success of the environmental movement. Because of the dedication of Rachel Carson and other lovers of the natural world, the course of our ecological history was changed. The Bald Eagle and its return to our landscape is a true symbol to live by for the coming years! Whenever I experience a heartfelt communion with a physical expression of LIFE - plant, animal, or human - I feel the most connected. Communion with Nature is essential at this time. Our Yoga practice facilitates this communion by relaxing us, opening us up, and bringing us into the spirit of breath. Yoga helps us set aside our fears and worries which keep us from from dissolving into the present moment and connecting with the BEAUTY that awaits us. In this time of new beginnings, set aside some time to facilitate this communion with nature. Let the beauty in through your senses - bathe in our beloved waters, sip a cup of tea as you watch the birds outside your window, or bundle up to take a walk in nature. I'm teaching several special workshops in the coming months that are here to support you in this practice shall you desire! More information below.